You can use AXIS statements to modify the tick marks that appear on the chart spokes and the order in which the tick mark labels appear. 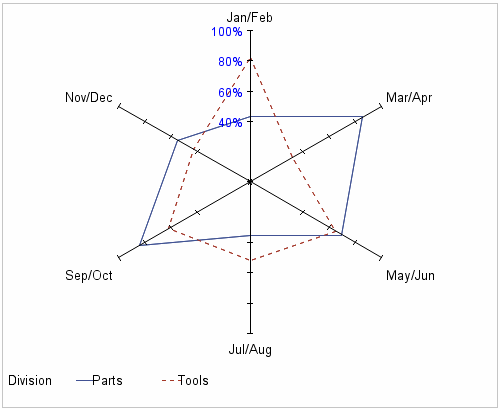 This example uses AXIS statements, in addition to formats, to modify the tick marks, tick mark labels, and axis labels on the radar chart spokes. Create a user-defined format, MNTH, for the axis labels. Replace library-specification with the path to your library. Create the input data set WORK.GOALS. The user-defined format is applied to the variable MONTH, and the SAS format PERCENTN7.0 is applied to the variable VALUE. Define tick marks for the chart spokes.The AXIS1 statement controls the tick marks for the first (12 o’clock) axis. The ORDER= option specifies the tick mark interval and the actual values that correspond to each the tick mark. The format PERCENTn7.0 that was applied to the variable VALUE in the DATA step controls how the values are displayed for the tick mark labels. The VALUE= option specifies the size and color of the tick mark labels. The AXIS2 statement controls all axes except the first. For those axes, the VALUE= option specifies that no tick mark labels are displayed. Create the radar chart. The STARAXIS= option tells the procedure to apply the AXIS1 statement to the first axis and the AXIS2 statement to all other axes in the chart.